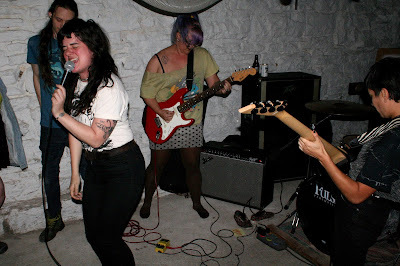 Bay Area punks Neon made Kansas City the third stop on their inaugural tour on Saturday night. Following an opening track that featured a spiel satirizing American consumerism, the group called for all non-men to step to the front. The group's steadfast idealism makes sense considering the Bay Area's long history of political punk rock and that it's led by Maximum Rocknroll coordinator Grace Ambrose. Neon's 15 minute set wasn't the biggest and baddest thing to roll through town this year, but its passionate delivery and novel approach to lyricism successfully set it apart from the pack. Hot off the online release of its demo, Kansas City's Nitecrawlers closed out the evening. The 'crawlers, through constant gigging, have truly grown up since their summertime infancy. Their Saturday night set was as strong as several other recent performances, despite the PA's power malfunctioning for half the set. Most punk bands are given the benefit of the doubt at their first gig, but the second performance from local duo Cough Syrup lacked in all the same categories as the first. The compositions sounded as if a wheel had been spun and the arrow had landed on "punk." Those songs were presented in a crude, rudimentary manner and carried little-to-no momentum through their runtime. This gig also marked the second performance of Olivia Gibb's alter-ego Miss Lady. Whether or not she has intended it, Gibb's outings as Miss Lady have functioned as a sort of performance art. Her absurd lyrical topics, lone presence on the stage (basement floor), and straight-faced demeanor forced the entire room to awkwardly squirm and giggle throughout her short set. Gibb's Miss Lady character deserves a short film.